UPDATE: The original article we cited said that Benetton was one of retailers that sourced from the factory, but Benetton has reached out to us to say that they are not current manufacturers for Benetton. Forgive our French, but if this isn't a sign that big-box retailers need to wake the flip up, we don't know what is. (Maybe if our clothing came alive at night and tried to eat us, Ghostbusters-style. Perhaps that might incite the industry to action.) 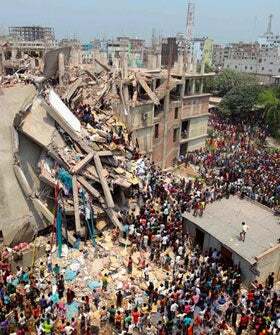 An eight-story building that housed several garment makers collapsed in Bangladesh Wednesday morning. According to Bangladeshi officials and media outlets, over 70 people were killed and upwards of 600 were injured, and many are still trapped. As NPR reports, some of the companies within the building were responsible for creating material for The Children's Place and Dress Barn, and plenty of others. What is particularly egregious about this newest tragedy isn't just the brands involved (c'mon, we should know better), but the fact that, as the Times reports, "workers told Bangladeshi news outlets that supervisors had ordered them to attend work on Wednesday, even though cracks were discovered in the building on Tuesday." Which means that workers spied the infrastructure giving way and warned superiors, and they were still forced to head into work underneath a shoddy building. It isn't just sad; it's shameful.